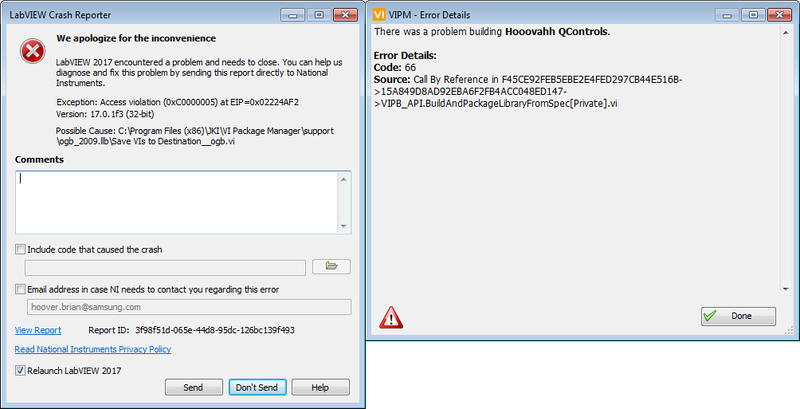 I have a build that crashes LabVIEW with an access violation, and then VIPM gets an error. The build is attached. What the problem is, is that in there is a class, and that class is renamed during the build process adding the suffix "_hooovahh". But in that package is also a demo VI named "Defined Slider Test.vi" which uses a property node on that class. I've found that if I build, with the demo VI having a property node, linked to the existing class name, that during the build a rename takes place and crashes LabVIEW. If I disable the rename it builds properly, and if I enable the rename, but remove the property node in the demo VI, it also builds properly. I also found that if I add this demo VI to the class it renames properly which for now is a fine work around. Can this bug be addressed so that VIPM properly builds and renames the class, while not crashing LabVIEW if a property is linked to the class in another VI?